Mt Superior's south face. This photograph (which I took on Christmas Day) is framed and on our living room wall. I've been wanting to ski Mt Superior's south face all season. 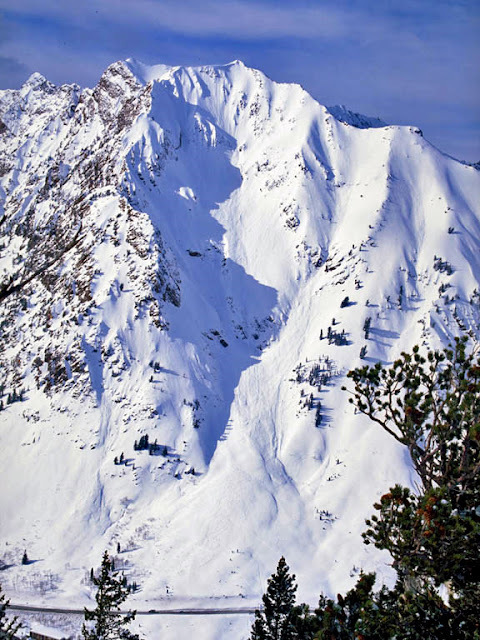 It is, perhaps, the classic ski line in the Wasatch mountains. Head up Little Cottonwood Canyon, and you can't help just stare up at it. Its an absolutely beautiful mountain, but also a major avalanche path that can easily cover the LCC road a few times a year. From below, and from pictures, it almost looks too steep to ski. Andrea and I both had Friday off from work. On Wednesday, she told me that she was ready to ski Superior. I was excited to hear that, and it was game on. Some new snow (but not too much) fell on Thursday, and the skies parted and the sun came out on Friday morning. Perfection. The skiing on the north side was superb. Several inches of super-light powder on top of a non-breakable, but not icy, base. Andrea called it "one of the best runs I've ever done." And this was only the warmup! Andrea with the Monte Cristo headwall behind her. That line is on the list for next time. On Superior, with 3000 feet of steep skiing below me. I've been waiting for this all winter. The first half of the line was powder. Andrea skied it like a pro! Andrea skiing. This gives you a good feel for the scale. Me again. Look at that gigantic cornice hanging up above to the left! The skiing was incredible. Top half was powder. It got heavier as we got lower, and the bottom third of the line (the apron) was like skiing through cream cheese. Fast and fun! We couldn't believe we hit it in such great conditions. Perfect timing, too. Any later in the day, and it might have been too late. We triggered a handful of small loose snow and soft slab avalanches. All were easily manageable by traversing out of the way of the moving snow. But terrain management was key, and I wouldn't want to be on that slope if anything bigger was coming down. At the road, feeling happy to have finally done this! This is a picture of what we skied, taken from the other side of the canyon. Start at the pointy tip at the top, ski to the road. Its looks intimidating and dangerous, but it was actually very straightforward and SUPER FUN! And then debated climbing Wolverine (left) and skiing Stupid Chute (Andrea's idea! ), but settled on Patsy Marley peak (right). Final thoughts on our Mt Superior debut? 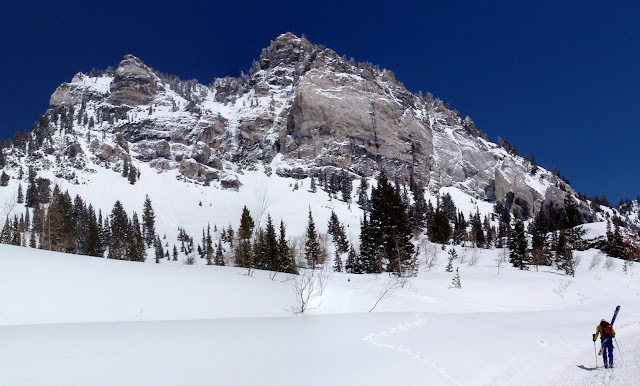 Honestly, its one of those things that seems intimidating when you look at it, but if you're a good skier, can assess conditions, and make good choices when it comes to terrain management, its really not that hard. Andrea and I both feel like its a really fun face to ski, and one that we're sure to repeat. Its a classic.